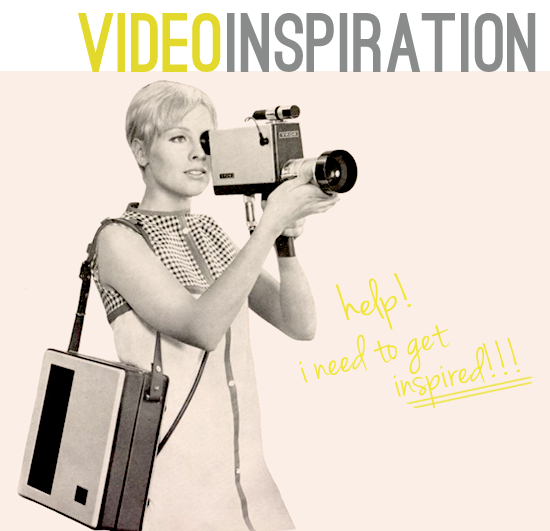 Bubby and Bean ::: Living Creatively: Need An Inspiration Boost? Watch These. Do you ever have those days where no matter what you do, you just can't get out of a slump? Where you find yourself staring aimlessly at a chip in the paint on the wall? Where you become increasingly frustrated as a project you've been working on for hours just isn't going anywhere? Where Pinterest, as amazing as it is, just isn't doing it for you? Where you just don't FEEL like being creative? My number one suggestion for those periods of un-inspiration is to take a nice long break. But if you're someone (like me!) with a career in a creative field, you can only take so many breaks and still pay the bills. I had one of those days yesterday. The weather in Chicago has been so dreary, and two cups of coffee wasn't even phasing my desire to crawl back into bed. So I went out for a late breakfast at my favorite organic restaurant, listened to some killer music while I ran errands, and called a dear friend. And when I returned to my studio, all refreshed and ready to make magic happen... Nothing. Splitscreen: A Love Story by James W Griffiths. This beautiful little film was shot entirely on a Nokia N8 mobile phone! Metropolis - A New York City Timelapse by Will Boisture. A freelancer, Boisture shot this short film over two year in little windows of free time as a means to capture the vibrance and beauty of the city he calls home. Firekites - AUTUMN STORY - chalk animation by Lucinda Schreiber. This chalk animated music video is so simple and stunning. What helps you get out of creative slumps quickly? Top graphic designed using vintage Sony video camera ad from the Rewind Museum. Awesome videos! Definitely inspirational! My favourite is the split screen one! This is a great idea for getting inspired!! I like that it's easy and a quick fix :-). ThaT Move video is so cool and I felt super touched by Autumn Story. Than you for putting these up! I love these videos! The Splitscreen Love Story is my favorite! Those were amazing. Loved all of them! I especially liked the last one. These video are just magic! I love the travel one... makes me want to get on a plane ASAP! Thank you! I'm definitely in need of inspiration! melissa, you're awesome! the 1st video reminds me of living, & all the things there are to see, & do. the chalkboard animation video was used as inspiration in an art class. i studied that thing, drawing the evolutionary processes that appealed to me, with black paper, & a white colored pencil. great video finds. The chalk one is pretty interesting.